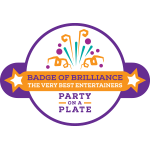 Most 3-4 year olds are at the stage where they get really excited about going to parties, and then get a bit nervous when they arrive! More often than not a parent or carer will need to stay with them, at least for the beginning, and they will probably watch the first bit whilst clinging to a comforting leg. After a while they warm up and get totally involved with everyone else. Bearing this in mind, John has developed his 3-4 year old parties to start gently so that the children can get used to him and get to know him. As they begin to warm up, he introduces slapstick and silliness which they just love. 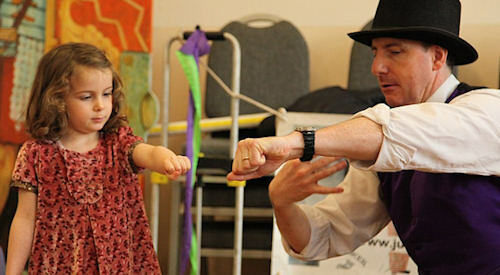 Then there follows puppets, juggling and magic. By the end of the party they are all totally involved and buzzing. At this age John tends to leave out the dangerous sword and fire tricks, but some parents and their 4 year olds insist on a bit of fire juggling at the end! Other parents are horrified at the idea. It all depends on your child's experience and temperament. John is very flexible and is happy to accomodate your preferences. 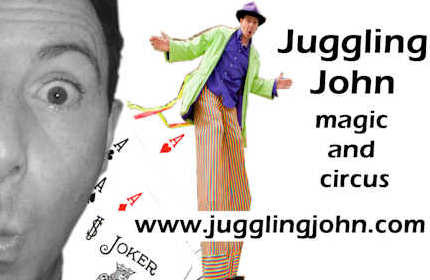 A. a 45 minute show including juggling, magic, balancing, mime, clowning and puppetry.